Password protecting a PDF file helps you ensure that even if the document gets lost the content won't be available to anyone else unless you shared the password with them. 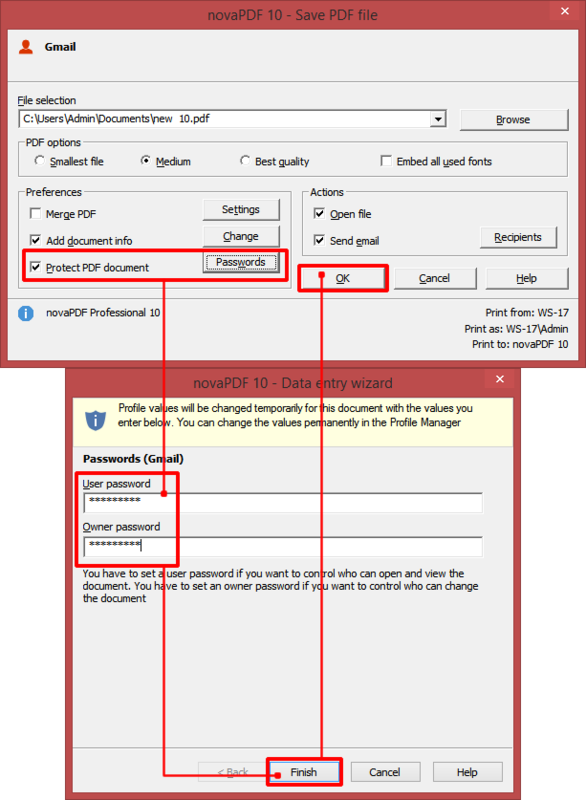 novaPDF Professional is a program that allows you to password protect PDF documents when generating them (this option is not available in novaPDF Standard or Lite edition). You can download it from our Download page. The first method is to change the default printing settings to password-protect a PDF file for the current print job only - this means that everytime you'll want to password-protect a PDF file you'll need to modify the printing settings. 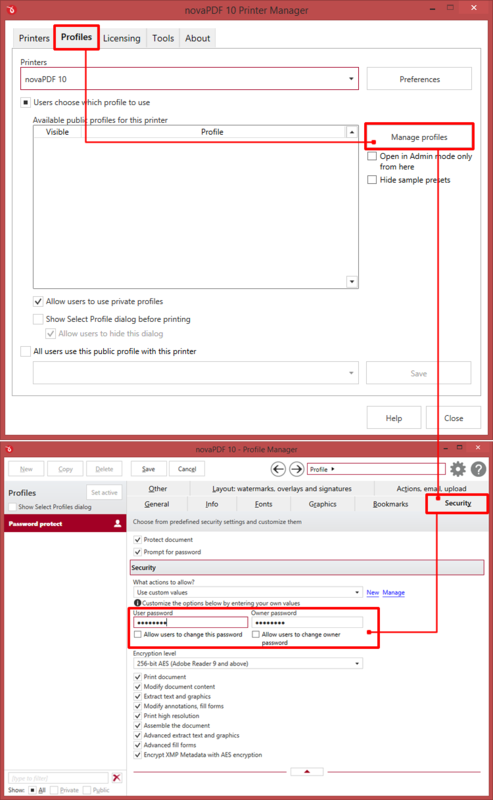 The second option is to create a printing profile that will password-protect any PDF files that are created with that profile this way, everytime you'll want a PDF protected you just need to select that profile and no other changes will be required. Open the document that you want to convert to PDF and password protect. Go to File->Print and in the Printers section select novaPDF before clicking OK. In the Save PDF file window that shows up check the option to Encrypt PDF document. Click on the Password button and enter an User password and/or an Owner password. User password is for opening (and reading) the PDF file. If you define an user password before generating the PDF file, when someone will want to open the resulting PDF file it will have to enter the user password to open it. So only the ones that know this password can read/open the password protected PDF file. Owner password is set for changing the rights of the PDF file. The owner password is not requested when opening the PDF file but it is requesting when you want to change something in the password protected PDF file that was restricted from modifying. Click on OK and the PDF will be created with the password you entered above. The PDF will be opened in the default viewer and for opening it will require the set password. If you want more advanced password protecting features, you'll need to define a printing profile via the Profile Manager. Go to the Security tab and check the option Protect documnet. By default novaPDF is set to Allow everything meaning if the recipient of the PDF has the password he will be able to read, edit, copy, print and so on. You can choose a more restrictive level under Security by choosing from the drop-down to Allow Changes only, Allow Copying or Allow Printing. You can also click on New to define your own security preset. You can setup a password for opening and/or modifying the PDF document by entering it in the User Password field (Owner Password lets you require a password when changing the security features of the PDF, not when opening it). Select the Low Level or High Level Encryption method depending on the protection level desired. Optionally adjust the other settings (Print document, Modify document content) that were set by the Security profile you chose. If you start modifying those, the security profile will be set to Custom. If an option is checked, it means that the user with the password will be able to do that action to the PDF file - if it's unchecked even if the password is entered the action won't work. If you want to disallow readers to print the password protected PDF document, you can do so by unchecking the Print Document option in the Document Permissions section. Additionally, you can allow printing only in low resolution (150 dpi), by checking the Print Document option but unchecking the Print high resolution one (allowing only low resolution printing also prevents users from using optical character recognition software to create a similar document). If you want to disallow form filling, make sure the following options are unchecked: Modify Annotations, fill forms and Advanced form filling. You can set additional document restrictions, and by default, when either Low Level encryption or High Level Encryption is selected, all the restrictions applicable for those options will be enforced. The Low Level encryption method allows you to restrict access so that the user opening the password protected PDF will not be able to: Print document, Modify document content, Extract text and graphics, Modify annotations, Fill forms (the checkboxes beside these options are not checked by default, if you want to allow one of these options you'll have to check the option). The High Level Encryption method, beside the restrictions of the Low Level Encryption method, allows you to restrict access so that the user opening the password protected PDF will not be able to Print high resolution, Assemble the document, Advanced extract text and graphics, Advanced fill forms. Note that when using any of the two types of encryption that novaPDF supports, the resulting PDF files will have their contents encrypted (even if you don't set a password, but only select an encryption option) so search engines won't be able to index the contents of the PDF files (nor their metadata description). You can check to see if your PDF has the content encrypted in Adobe Reader, by pressing Ctrl+D and clicking on the Security tab. If the content is encrypted, you should see the following text under the Document Security section: All contents of the document are encrypted and search engines cannot access the document's metadata. This tutorial explained how to password protect PDF documents or apply other security restrictions, if you have any suggestions for improvement leave a comment or rate the article. Protect generated pdf files with a password. Configure the level of protection and restrict certain document permissions.